Travelling Times: Plzen and Pilsner Beer – A Danube River Cruise Favorite! Plzen and Pilsner Beer – A Danube River Cruise Favorite! We were touring the Czech Republic, on our way to Prague, which I was really excited to see, a side trip on our Danube River cruise. The guide said we were going to stop in Plzen (Pilsen), a small town that was the home of Pilsner beer. It actually didn’t sound very interesting to me – boy, was I wrong! First I discovered that Plzen was the center of a great skiing area. I remembered the Winter Olympics in Kitzbuhel and how thrilling it was, with Franz Klammer attacking the mountain for the Gold Medal. What a moment and now I was near the spot. How cool was that? The small and quaint city just got more significant, and as we walked around, I fell in love with the beauty and freshness of the small Alpine city. It was easy to find the Plzen brewery – the complex of buildings was huge, and was easily spotted. It seemed like every corner had a pub, and it quickly became apparent that locals really enjoy their brew. I don’t drink much beer, so I thought it would be nice to just visit the Brewing Museum, housed in a building that had supplied the local brewers with malt in the middle ages. I had toured the Coors Brewery in Golden, Colorado when we were in the area for a ski trip, and thought I had an idea about what a brewery would be like. But to see the pilsner history, the long tradition of beer, on display in a house from the 15th century – I quickly realized that the Czech Republic had a much longer history with beer than we did in the States. We got to visit the malt house and see what they called the malt floor, where the soaking and germination of the grain took place. Then we saw a malt kiln – an oven which stopped the grain germination process at the proper moment. Evidently the brewing process was really complex, and I was surprised by how interesting the exhibits were. The collection of beer bottles from different Czech breweries was a fun visual moment. We didn’t have time on our tour stop, but they told us that there was a labyrinth of passageways, cellars and wells from the 14th century that ran under the town. Plzen beer history was turning out to be a lot more fascinating than I had imagined. I found out that the most famous beer in the town was Pilsner Urquell, known for clear, golden lagers that sounded like the claims of the Coors brewers – light and fresh. 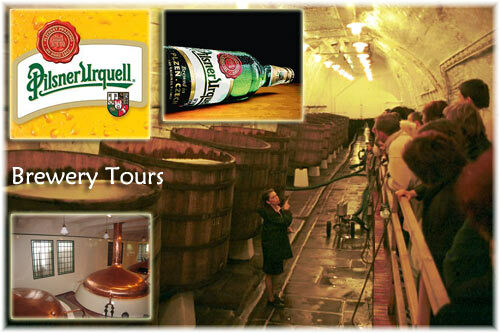 As we stopped off in the Pilsner Urquell Brewery I found out there was time to tour the underground brewery cellars after all. The guide kept us on course so I never felt like we were lost, but I saw so many low lit side tunnels that I got the feel of how extensive these cellars really were. Then came a very unexpected and special moment. My grandfather fought in World War II with George Patton’s army. He never said much about it, but I had seen the movies and read books about the war. I found out that every five years Plzen celebrates the liberation of the city by Patton’s 3rd army. They still honor the liberation - all this time later. Then I saw the plaque – in gold lettering “Thank You America!” and underneath it described how on May 6, 1945 the city was liberated by the U.S. Army. It brought tears to my eyes. I’d like to get Poppy to talk about it all, but at 87, I wondered if that would happen after all these years of not talking about the war. I’d like to know if he was part of that liberating force. I suspected he was. I knew I would bring my children back to Plzen to see this. That’s how Plzen blossomed from a stop to find out about local beer, to become one of my most intensely personal and memorable destinations on our Danube River cruise experience.